Frankfurt/Main main station is well connected to the German ICE network, hence accessible easily from all over Germany. Take the urban railway S5, heading to "Friedrichsdorf (Taunus)" and exit at Seulberg. From here walk 5 minutes. Take the highway A5 and change to A661 at the "Autobahnkreuz Bad Homburg". First follow the signposts to "A661/Kassel/Bad Homburg/F-Bonames-Mitte", later to "Friedrichsdorf". In Friedrichsdorf head to "Sportzentrum". Parking grounds can be found in a distance of approximately 150 meters. From Frankfurt/Main airport take any train (regional train or urban railway) to Frankfurt/Main main station. Change train to urban railway "S5" (heading to "Friedrichsdorf") here and exit at Seulberg. From here walk 5 minutes. Different opening hours and days – see website. In the Taunus (a low mountain range north-west of Frankfurt am Main) an astonishing experience can be found: the climbing forest Taunus in Friedrichsdorf. Welcome to the Jungle ... this could be the right description for the climbing forest Taunus (Kletterwald Taunus). There are 11 different courses for climbers – with different levels of difficulty, starting with a light one for beginners and kids and finishing with an absolute "adults only" course for experts. The particular courses are labeled with colors – green = light, blue = light, but more complex than green, red = intermediate, crimson = between intermediate and expert and black = expert. The highest point on one of the courses is 25 meters above the ground – and this means that the climbing forest Taunus has the highest climbing course in Germany at all. For the courses, there is no climbing experience necessary, as every visitor will be instructed in detail about safety regulations etc. So it goes without saying that one doesn't even start with the most difficult courses but rather starts with a light one and then raises bit by bit. Every climber has to show his/her climbing ability to the skilled staff, and the equipment (helmet, belt and snap-hook) is always kept up-to-date. Highlights are the "Tarzan Jump" in the "Sella Ronda" course (crimson) and the giant slide "RR185" which is 185 meters long (in the "Gasherbrum I" course – crimson). The prizes are okay: 2 hours is 9,90 Euros during the week and 11,90 Euros at the weekends. 3 hours is 11,90 Euros during the week and 13,90 Euros at the weekends. If you don't want to try it out but want to be a spectator, you are warmly welcome for free. Prize status is 2014. Not far away from Friedrichsdorf the „Taunus Therme“ in Bad Homburg can be found. After an exhausting climbing adventure this is the perfect finish of the day. More than 1,400 square meters of water plain and a huge number of saunas, steam bath, tanning booth, brine baths etc. offer a perfect spa experience. Indulge yourself with a massage or beauty treatment. The roman castle Saalburg - a trip into Roman times. In this museum, you travel 2,000 years back in time. The castle belongs to the UNESCO World heritage and is part of the "Limes" which was the border between the Roman Empire and the area of german clans. There's a 2.4 km long round trip around the castle where the visitors learn all about the archeological relicts. Inside one finds a couple of buildings from the former castle. "History comes alive" here. The castle in Bad Homburg was built by the Hesse-Homburg landgraves during the late mid ages. It's „White tower“ that surmounts the castle itself by many meters is the landmark of Bad Homburg. Besides an amazing large park, there is a beautiful courtyard inside. The castle and its garden can be viewed all days, and there are guided tours available on application. 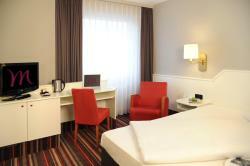 The Leonardo Hotel is located in the heart of Frankfurt/Main, literally 100 meters from the main central train station. Thanks to sound proof windows, the rooms are quiet, modern and the hotel offers its guests a daily breakfast buffet including an organic food section. Needless to say that with such proximity to the train station the conection to the rest of the city is excellent, also including access to the Frankfurt Messe. 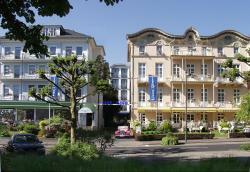 This 5-star hotel opposite Bad Homburg's Kurpark spa gardens offers an elegant Art Déco design and spacious, soundproofed rooms. It provides fine dining and a conservatory café. This Mercure hotel offers air-conditioned rooms, an indoor heated pool and free parking. It is located in the quiet town of Friedrichsdorf, on the eastern edge of the Hoch-Taunus Nature Park. This privately-run hotel is quietly situated in Bad Homburg in the scenic Taunus Mountains, just 5 km from the A5 Motorway. It features 2 restaurants and a stylish cocktail bar. All rooms have an en suite bathroom, a telephone and cable TV.